Combine marinade ingredients in a medium bowl and mix well. Place the ribs in a large GLAD® Food Storage Bag and pour in marinade, ensuring ribs are fully covered. Set aside and marinate for 2 hours, or overnight in the refrigerator. Set up a two-zone fire for indirect grilling with Kingsford® charcoal by situating the charcoal on only one side of the grill, leaving the other side void. Heat to 400°F. Lightly oil the grill. Remove the ribs from the marinade and dispose of excess liquid. Place the ribs, bone side down, over direct heat and cover the grill for 6 to 8 minutes. Then turn the ribs and cover for another 6 to 8 minutes. Continue this process for 45 minutes to an hour or until ribs are tender. The USDA recommended minimum temperature for pork ribs is 145°F. 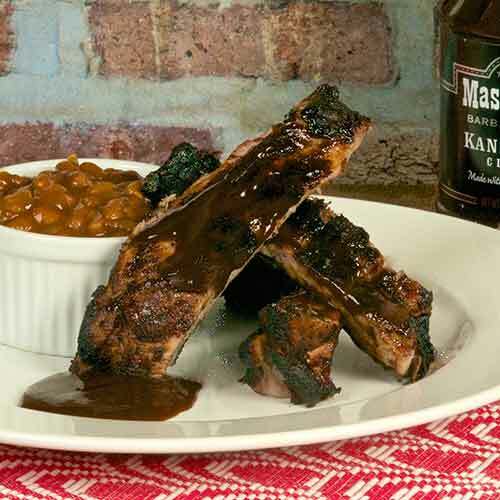 Once tender, move the ribs to the void side of the grill and coat with additional KC Masterpiece® Kansas City Classic Barbecue Sauce. Cover the grill for another 6 to 8 minutes. Remove ribs from the grill and cover with butcher paper or aluminum foil. Let rest for 10 to15 minutes. Slice the ribs into individual pieces and serve.